Among the many research projects conducted during the B121 cruise, trophic ecology has taken an important place for divers and fish specialists all along the campaign. But what is it about ? Beyond the formal and bit severe words, trophic ecology can be simply and instinctively recapped by the famous idiom “you are what you eat” ! Every single piece of snack each of us ingests or drop of liquid we are happy to sip not only contributes to maintaining our whole body in good shape but also, and insidiously leaves its indelible mark in our organs. This holds true for all living beings and for isotopes as well ! Analyzing the composition of organisms in Carbon, Nitrogen and Sulfur stable isotopes can tell us a lot about the long story of what they usually eat and where they have been living. Eventually, analyzing the isopotic composition of organisms living in close vicinity to each other in a same place can help unreveal biological interactions between them in the food chain that is, who’s eating whom and what. That’s why specimens of some common and key species of the visited sites were sampled at the sea bottom, from seaweeds to sponges, worms, starfish, sea urchins and fish, to caracterize main food web elements and compare them between sites. The complexity of food webs is also a condition of ecosystem resilience facing climate change, the more redundant and complex biotic interactions are in a food web and the more likely the ecosystem is to resist to change. Let’s wait a bit and see what isotopes will tell … ! On March 20th, we were working in Foyn Harbour, our latest station, and completing the sampling. Everything is fine, and now the team’s work has reached an optimum in terms of fluidity and efficiency. But the time has come to leave. With Ben, we are keeping a close eye on the weather forecast, and the time is right to head back to the mighty Drake. First, we were planning to leave on the next day, but then we felt it would be best to set sails earlier, late afternoon or in the evening at the latest. This was a bit earlier than anticipated, but very strong westerlies are forecasted in a few days, as well as headwinds towards the end of the crossing, next to Cape Horn. No time to waste anymore. After a last dive in Enterprise Islands (right next to Foyn Harbour), on a shipwreck, we pack all our gear and get ready for the crossing. Done in a little more than an hour. We prepare the ship, and by the time we are ready to go, snow starts falling heavily, significantly reducing the visibility. We still need to cross the Gerlache Strait, and pass by the Melchior Islands to make our way to the open ocean. Not that easy with no visibility, icebergs and reefs all around us. The radar is our eyes, and we sail very slowly… At 0:30, we hit something, and the familiar noise of the hull against ice sounds really loud. Close encounter with a big iceberg. The hull of the Australis was spared this time, but not the anchor, properly bent. But we manage to reach the Drake Passage at the end of the night and start the crossing. A long crossing again. The Drake Passage gives me this strange impression of being in a time capsule. Everybody gets ready and braces for the crossing. Our bodies go in standby for 3 days. I’ve spent most of the time in bed, probably seasick. Any normal life task is very demanding and you struggle to get your ideas together. The final part of the crossing, once we’ve reached Cape Horn is tricky as well: the ocean is still rough, and we get the false impression that the crossing is over, when there is still a full night of navigation, this time closer to land, closer to rocks. At that point, and this is why I called this blog “Through the eye of the needle”, we checked the weather again and realised that 2 hours behind us, the storm was closing the path with very strong winds, the kind you don’t want to find yourself in. Lesson is, and probably for the rest of the expedition: always listen to your instinct. When it tells you its time to leave, leave! The Beagle channel brings serenity after the crossing, and we reached it at the end of the crossing, enjoying a very peaceful ending to the expedition, reaching our final destination, Ushuaia. Now that we are back to the connected world, we will feed this blog and our website, so keep up with us. “Wow, this little guy was a flatworm and not a leech“ or “Hey, look at this structure on the right, it is key for the identification “ are just two examples of B121 exclamations associated to someone looking at a macro-picture. That’s the key advantage of macro-photography: it gives you precious information to identify the organisms onboard (or after the expedition). Last but not least, this is also a good resource for future scientific publications and outreach activities. That’s why Quentin (Jossart) is spending few hours every day to capture the most common or interesting species collected throughout the day. Photographing them alive is an asset because some structures or colors can deteriorate after preservation. A lot of patience is thus sometimes needed as some animals are constantly moving… “Please mate, stay here a seecccooonnddd” is the most polite exclamation that has been heard from the dedicated photo-area onboard. …and thanks for all the fish? operating base, the Australis, is anchored there. water of the iceberg and loudly recharge their lungs with fresh air. ignored. We value their company nevertheless. ultimately important to understand and protect the unique Antarctic fishes. to enjoy the voyage to Antarctica. Finding your own space in tiny cabins, sharing one shower or dealing with your cabin mate snoring are all details that become part of a daily routine that we all (have to) embrace. as well as planning or personal feelings. First is Katie, who’s in charge of everyone’s happiness inside the boat. herself a brilliant biodiversity catcher on Antarctic shores. success of the Belgica121 expedition. lemon drizzle cake. Wonderful smell! electronic failures from our ROV (Remotely Operated Vehicle) systems. video footage for our documentary. tells a different story and unveils some of the unknowns we are after. have achieved together so far. Among the projects investigated during the B121 expedition, one is the study of intertidal (seashore) fauna, namely the animals that live between the low-tide and high-tide sea levels. The general view is that the Antarctic intertidal conditions (scouring by ice, high UV radiation…) are too extreme to allow animal life. However, recent studies have shown that animal communities can exist (and even sometimes persist) in some regions. That’s what our “Beach Boys” (Camille Moreau & Quentin Jossart) are keen to verify with “Good vibrations”. First observations indicate that Neko Harbour shows a low diversity while Melchior Islands shows a higher diversity. Next days will allow the team to investigate other locations… some of them in a “Fun, fun, fun” context as penguins or seals are never too far. Today was an exciting experience from dawn to dusk! We started early in the morning with the visit of Metchnikoff Point, a site on Brabant Island where a small memorial plaque has been set up nearly forty years ago to remind us about the crew and the incredible voyage of the original Belgica expedition that took place here 121 years ago. On that point the team lead by Adrien de Gerlache camped for about a week in 1898. After a steep hike on this rugged side of Brabant Island, avoiding the proximity of dozens of seals and several penguin colonies we found the memorial. No particular maintenance was required and we carefully put back in place the little statue of A. De Gerlache sheltered behind the plaque. On our way back we discovered the remains of a camp – not from 121 years ago, but much more recent. It seems to be a former, temporary scientist work camp, perhaps from the 1980s. Unfortunately, when abandoned, lots of plastic and other contaminating waste was left behind. Scandalized by such a vision in this environment we could not remain inactive and decided to clean up the place as much as possible. We returned to the Australis to equip ourselves with gloves and garbage bags and returned to the camp to pick up at least most of the pollutants that we could find (sometimes half buried in the ground). The remaining parts (wood pieces and glass bottles) had to be left on site due to lack of means to deal with it, time and space. Overall we brought back about 7 garbage bags of rubbish on board to be disposed of properly upon our return to civilization. Disappointed that we could not do more to clean the place totally we had at least the great satisfaction to have done an important task to try and do what we could to put it back in its pristine state. Leaving the island we encountered a pair of humpback whales, a mother and her calf feeding on a swarm of krill close to the ship. The sight was amazing and reminded us what a privilege we had to be in this part of this world and to witness this. Our next objective was to cross the Gerlache strait to reach our future research sampling stations: Useful Island, Dutiers Point and Neko Harbour. By the end of the afternoon we managed to prospect all these three locations and make plans for the next few days. 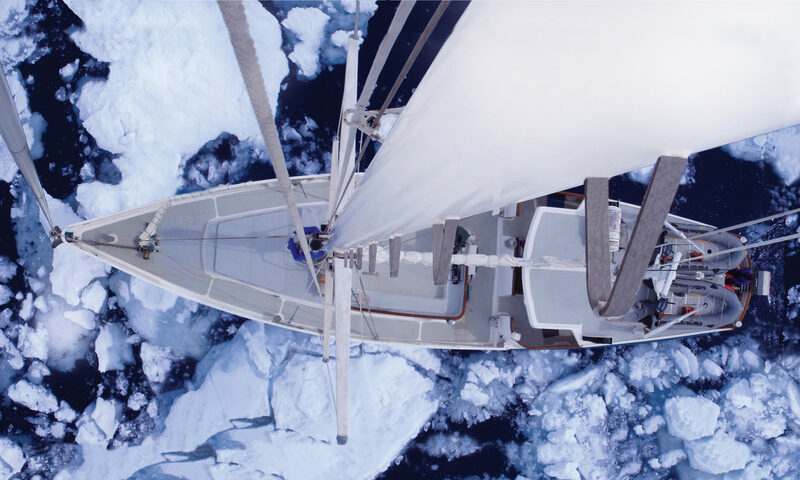 Stay tuned for the next message from the Gerlache strait!